Girlfriend wants some disc out... I have more but they aren't posted yet. Likely open to trades, but mainly selling. I haven't figured out cheap shipping if anyone would be able to help with that. Cost me like 6.50, so just add like $5 for shipping when asking prices. Third Row: 153G Prodigy Air D3. Inked, but in great shape. Flat top. Update: Photo is dumb and sideways... You can likely figure it out. Gray A, all four of them? Truth is traded to Scott. Other's are still available. Thanks Scott! wut do you want for them? i will also be willing to trade. I'm content with my bag at the moment. 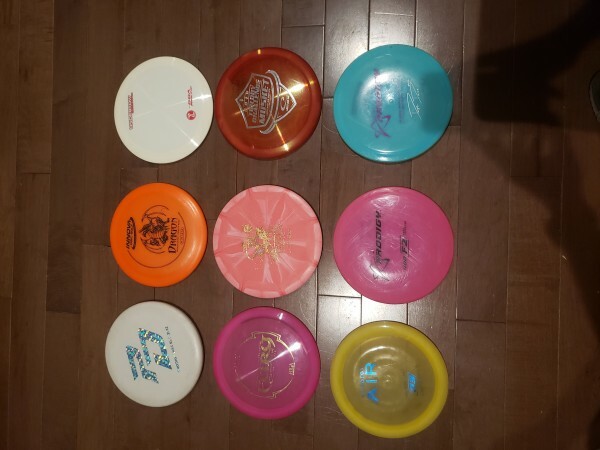 Open to trading for discmania disc. As far as price goes, I haven't had to ship four at once so I would need to look into that first. Open to offers as well. Just saw your comment. Yeah a bunch of tournaments in New England and one in Alabama this summer. I would say with flat rate box cost for shipping ($12.80), I could do all for 45 for all four. 45 would already have shipping included in it.